Two days until 2015 competition! With only a few days left in August, it is time to get your cameras, and make some amazing photos of your cultural heritage again! For 31 countries the competition has been prepared to take off in the coming days (please note in a few countries, different dates are being used), and you can once again participate in their national competitions. More news on the international competition is to follow later. 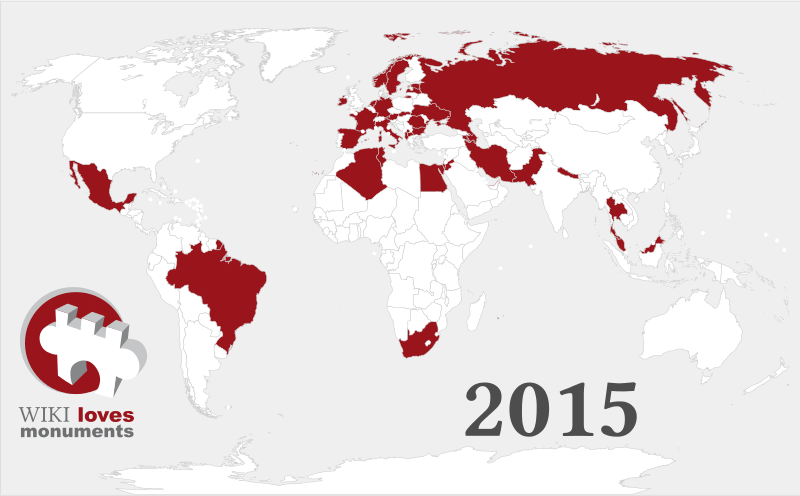 You can find a full and up to date overview of the participating countries on this page. Click on the country to find out more about the national competition. Why is the United States ignored? We have a little bit of history and a few monuments. How about the Statue of Liberty and the Viet Nam Wall? There are more. Hi Rhonda, countries ‘participate’ when a local team organises a contest – it is not a choice by an international team. In the US, the competition has been organised in the past, but in this year, the local organisers have chosen to focus their effort on another project. After all, Wiki Loves Monuments is organised by volunteers primarily. If it’s not too late, I want to organize WIKI loves monuments in Turkey. Please contact me.